These solid-state controllers will protect the 9300 pump from over-voltage and over-current conditions and will provide current boosting in low sunlight conditions, providing both protection and maximum water delivery. the SHURflo 9300 submersible pump. The SHURflo 902-100 controller is not waterproof, so it must be mounted in a dry location or an appropriate weather-tight enclosure. For use with a 24 VDC nominal PV array. Maximum input voltage is 45 VDC, and max output is 28 VDC and 5 A. The SHURflo 902-200 controller has all the features of the 902-100 and more. This controller is switch selectable for 12 or 24 VDC operation and includes a manual on/off switch for easy pump maintenance. The 902-200 controller comes complete with three high / low water level sensors and sensor wire. Water sensors hang in the well and are used to prevent dry-running in low yield wells. Maximum input voltage is 45 VDC, and max output is 28 VDC and 7 A. 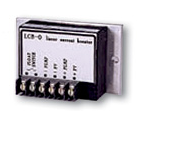 Use a single 36-cell 12 VDC module (reduced water delivery) or two in series for 24 VDC nominal operation. The 902-200 includes a weatherproof enclosure suitable for outdoor mounting. A single common 60-cell module can also be used with either controller, and will produce the 4A max current that the pump draws with only about 50% of full sunlight. This will increase the amount of water delivered per day by increasing water output early and late in the day or in cloudy weather.